Q: In what context were people introduced to SeaSketch? How did they use it to participate in the project? A: Many residents of Bali's north coast would like to increase tourism to their part of the island, which is significantly less visited than the South. We used the SeaSketch survey tools to collect opinions and ideas regarding two topics: (1) the future of tourism in north Bali and (2) the issue of non-biodegradable litter, a persistent problem in many parts of Indonesia and across Southeast Asia. Local collaborators helped me recruit participants, and typically we would meet in small groups of 5-8 at a time. I would introduce myself and my research and how it coincides with local and regional initiatives to consider the future of tourism in North Bali, and I'd invite them to participate in the two SeaSketch surveys. I'd demonstrate the SeaSketch tools they would be using and briefly run through the significant survey questions. Then the participants would have as much time as they wanted to take the surveys, with my local collaborators and me on hand to assist when necessary. A few foreign visitors and resident ex-pats took the surveys, too, though they participated on their own time--i.e., not during an organized meeting--using their own computers. They received instructions via a PDF illustrated with screenshots. Q: Did users identify SeaSketch features that were particularly interesting or useful? A: I noticed that they made good use of the layers, turning them on and off, to help orient themselves to the map. This may have been the first time some participants had looked at an aerial image before, so finding places on the map was not trivial. With a lot of zooming and panning, turning on and off layers and changing the base map I think that most people were able to identify familiar places. Q: What are some challenges of implementing web-based tools in rural Indonesia, and how were they overcome? A: Most people don't own laptop or desktop computers in that part of Indonesia, and for some this was their first experience with one. 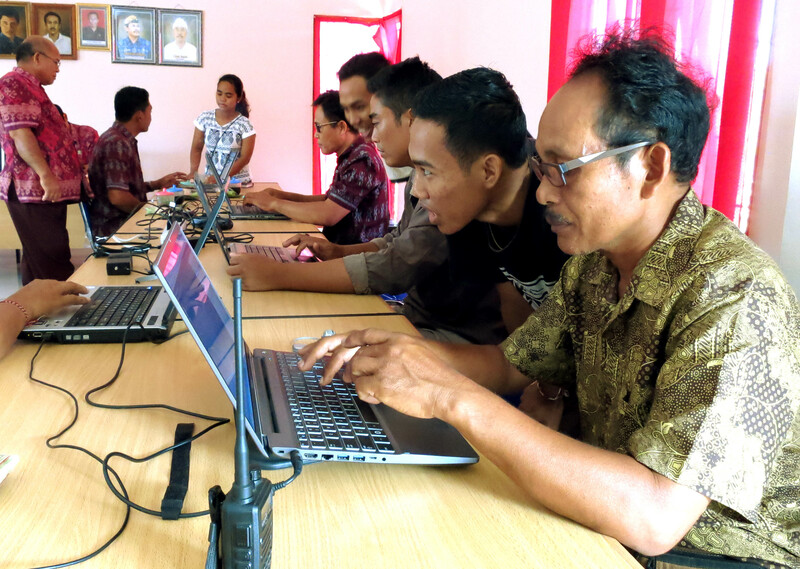 I depended on my Balinese collaborators to gently help participants with the hardware and software when they ran into problems--something I couldn't do as well without strong Indonesian and Balinese language skills. Since I couldn't assume that participants had computers of their own to use, I needed to provide all of the necessary equipment. It had to be portable, protected from rain and dust, and fit on the back of a motorbike. I ended up carrying the five laptops, a projector and miscellaneous electronics inside a large Pelican case with a jury-rigged backpack harness. Hard-wired Internet connections are hard to come by in north Bali, so a reliable cellular data connection made this project possible. Fortunately, Bali has better coverage than many parts of Indonesia, so I could set up a wifi hotspot that provided Internet access to the five project laptops. The connection speed wasn't blazing fast, but it was usually good enough for people to use SeaSketch without too much waiting for imagery to download. It was important to me that participants had the option of using SeaSketch on their own, though an assistant was always available to input their responses if they preferred. This meant that everything in the interface had to be available in Indonesian. I worked with an Indonesian translator who is also a GIS specialist, so he was already familiar with GIS-related terms and concepts and could translate them more appropriately than someone without that experience. Learn more about Kitty’s research in the UCSB Geography Department. For questions about implementing SeaSketch in your work, please contact the McClintock Lab (support [at] seasketch.org).